Around the corner from the buzz of the coolster Ace Hotel is No. 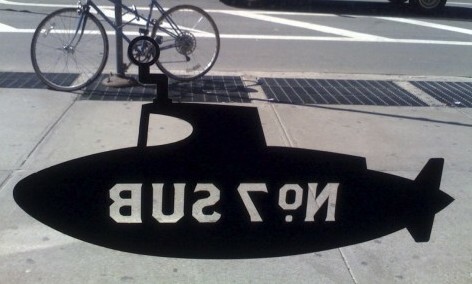 7 Sub, a sandwich shop on a mission – along with its submarine logo the darkly stylized counter set-up has the look of food chain aspirations. Though the artisanal-minded fills tasted real fine – it’s clear that the sub-men know how to take high-end ingredients and station them into a roll – my lunch-mate and I were put off from the bland chewiness of the sub roll dough. What might have been a wheat-flecked bread nostalgia play made an otherwise super sandwich a wee bit sub-par. Even so, it’s welcome grub-on-the-go option in the food-desert environs of 29th and Broadway. With no seating the wait time makes an order ahead your best sub strategy. No. 7 Sub, 1188 Broadway (between 28th and 29th Streets) 212-532-1680. This product is very helpful for me and I take it every day along with this product to help keep my erectile system in check. Cialis online without prescription. Canadian drugs are only shipped from our affiliated Canadian dispensary.